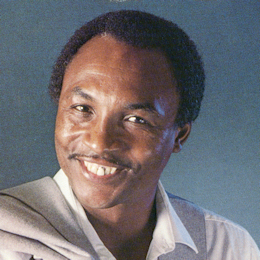 Frankie Lee Jones was born in Mart, TX in 1941, moving to Austin after High School. He met Ike Turner there and for a couple of years was one of the featured vocalists in his Revue. He then settled in Houston where he madehis first recordings for the tiny Great Scott label. 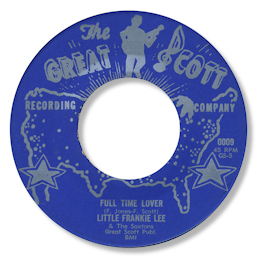 Both sides of his initial release are strong Texas blues – “Full Time Lover” is an answer to Little Johnny Taylor’s smash of course, but Don’t Make Me Cry has a mambo beat rather in the manner of Bobby Bland’s “You’re Worth It All”. This 45 was picked up by local musical head man Don Robey who recorded the the tracks again, and also recorded Lee for a further two singles. “I Gotta Come Back” is tough R & B but it was the blues ballad flip “Taxi Blues” that got the regional success and it has become his signature tune ever since. His final 45 for Robey “I’m Making Love” was another answer song, this time to Johnnie Taylor’s Stax smash, but again it was the slower side “Hello Mr Blues” which ha stood the test of time so much better. 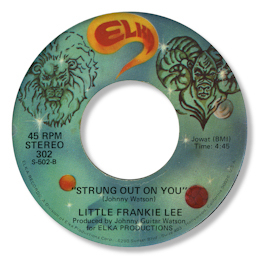 Frankie toured with Albert Collins for a couple of years before the move to California that kick started his career. He cut with his cousin Johnny Guitar Watson for Elka. “Love’s Repossession” was very much in the “Superman Lover” vein that Watson got into at that period, but rather more in Frankie’s established style was the heartfelt ballad Strung Out On You on which Lee sounded just terrific. 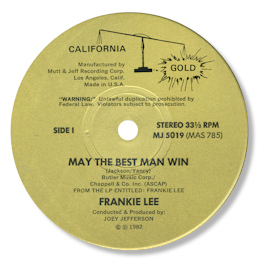 Even better was his cut of the marvellous ballad May The Best Man Win for the small California Gold label. I can never quite make up my mind wheter I prefer Frankie’s interpretation of this killer track or Reuben Bell’s. Lee is screamingly demonstrative, pleading on his knees, almost distraught with emotion while Bell has the slow burn intensity of a desperate man. Maybe they are as good as each other. These days Frankie Lee –along with Jackie Payne and Mighty Sam – is keeping the soul/blues flame alive, often working with that talented guitarist Bobby Murray. All of his albums, with the exception of the atypical and uneven African Wind, are an essential part of any self-respecting music collection. His mighty voice with its rough grained tone is still a joy to listen to, and each of his sets has had songs to treasure on them, often from his own pen. On “The Ladies And The Babies” it is the stand out minor keyed blues of The Woman Don’t Live Here No More, and on “Sooner Or Later” the heartfelt “Can’t Take No More” is the track that really hits the spot. On the soulful “Going Back Home” set it’s the insistent toe tapper “Finders Keepers” and on “Here I Go Again” it’s the ultra deep Rock My Soul on which Frankie sounds like he’s truly on the edge. I think his most recent CD “Standing At The Crossroads” is his best ever, a super set of new material from Dennis Walker helps of course, but also Frankie’s delivery just seems to get more and more accomplished. “Better Than That” is simply sensational but even harder than this track is Think What It’s Doing To Me which I would rate as at least as good as anything else recorded this millennium. Wonderful chord changes, some beautifully judged subdued horns and Frankie tearing out his heart. I’m now just waiting for his next CD – long may he continue to deliver the goods. UPDATE ~ Mike Finbow has pointed out that the Peacock version of "Full Time Lover" is a completely different cut to the Great Scott one. The second version is a rip roaring blues in the best Duke style, full of those wonderful horns, with Frankie at full throttle. Strangely the "Don't Make Me Cry" side is identical to the Great Scott 45. I'm grateful to Mike for sorting this out. UPDATE ~ I have caused some unnecessary confusion about the Great Scott tracks and the Peacock release. Mike Finbow has written to say that they are the same titles but Don Robey didn't just issue the Great Scott recordings but recut them. At first I didn't accept this but it turns out my intial copy of the Peacock one was very strange one - it had the same matrix numbers as my Great Scott 45! So I wonder if there were a few copies of a "rebadged" Great Scott tracks under the Peacock banner. But all bar my copy of the Peacock release were the newer recordings so I've amended the text and the discography accordingly. I'm very grateful to Mike for putting the record straight. 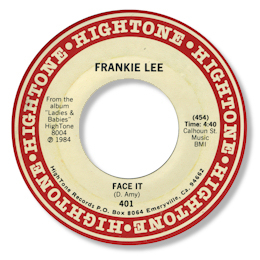 Note ~ Don’t make the expensive mistakes I’ve done in buying “Frankie Lee” 45s on IA and Paisano – they’re different artists altogether. Thanks to my great friend Kevin Kiley for the suggestion.